Fireflies and Jellybeans: Featured Friday - Treasures For Tots! Hello Fireflies and Jellybeans readers! 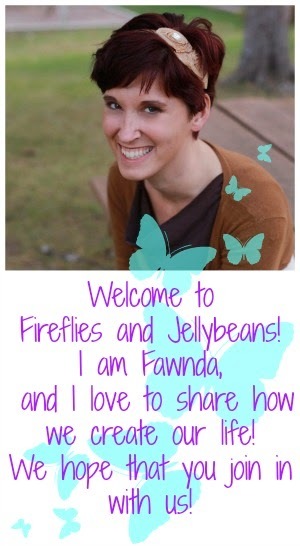 I'm so happy to be blog swapping with Fawnda! Fireflies and Jellybeans has the most fun DIY crafts! 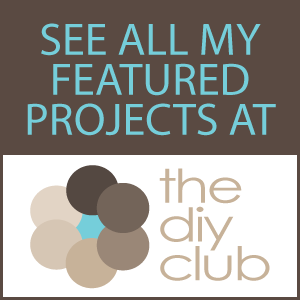 It's a wonderful and creative blog - I love visiting everyday! My name is Angie from Treasures for Tots! It's mostly a craft blog for kid-related stuff. I'm a stay-at-home Mommy to my beautiful 3 year old Darling Stinker, Serenity. She's the pretty little Muse and Model for most of my photography, handmade clothes and other crafty creations! 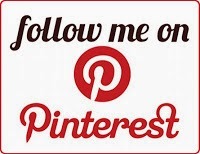 I love learning how to make new stuff, sew, embroidery, taking ( and learning to Photoshop) my pictures and finding interesting things on the Internet other people blog about, make, sell or do all three! 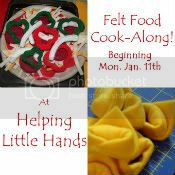 I love making felt food - especially if it's easy, or not all that hard to make! Today I have a delicious addition to my felt food line-up! It's a felt eggplant, spinach, and tomato lasagna! I got the idea from a recipe I found here! Remember to click on a picture to ZOOM in! Red, white, off white (or pale yellow), green, yellow (goldish), and purple felt. I used felt from American Felt and Craft. 1. 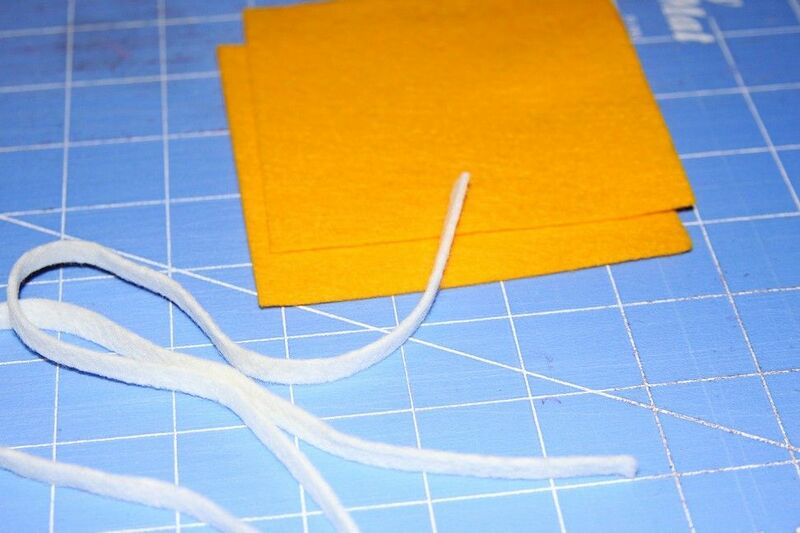 Cut a strip off white (or light yellow felt) 4"w x 9"l and a strip 3"w x 9"l.
2. Fold the 4"x"9 felt like the picture below - you're gonna fold it sorta like window blinds. 3. 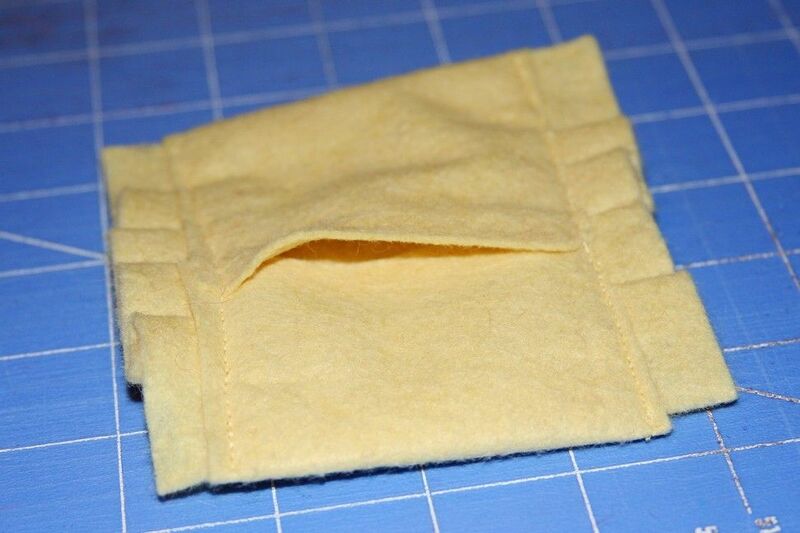 Take the 3"x9" strip and fold over down the center of the 1st strip - make sure the seam is on the bottom. 4. 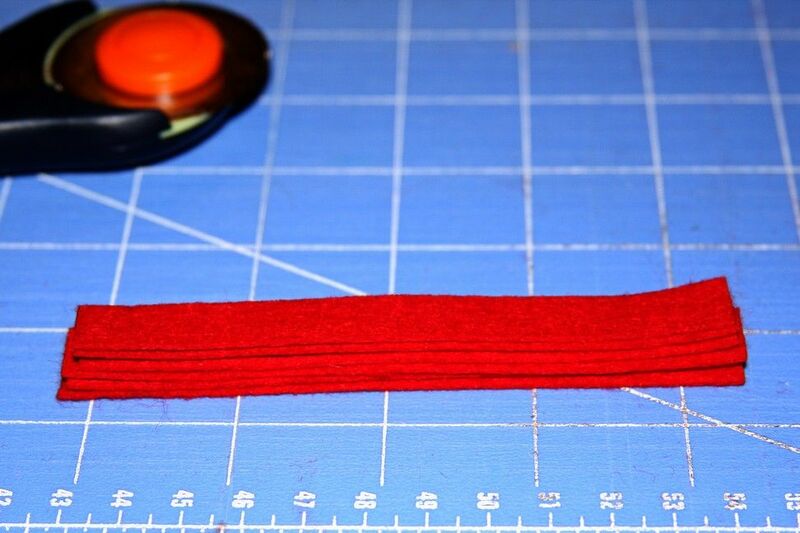 Sew down the sides of the 3"x9" strip. 5. Flip over and hot glue the seam opening closed. You now have lasagna noodles. 1. 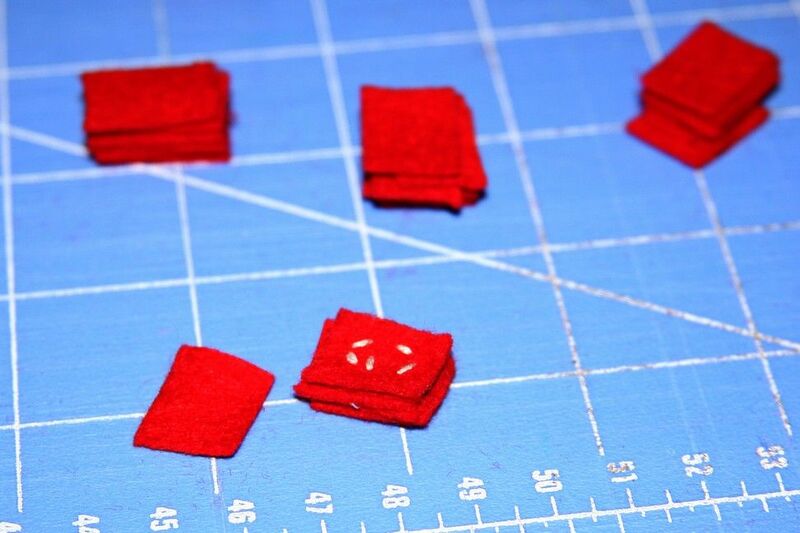 Cut (4) 4"x4" red felt squares. 2. Embroider either a fly stitch or a "V-shaped" stitch for the "herbs", and large french knots for the "meat" on all four pieces of felt. Or you could just embroidery two pieces of felt. 3. 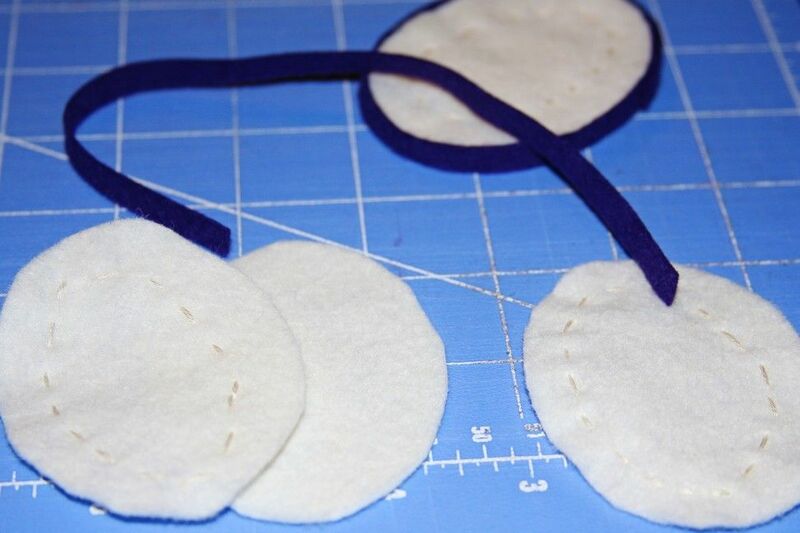 Hot glue two pieces of felt together, make sure the embroidered pieces are facing outwards. 4. Repeat step 3 for the last two felt pieces. You now have two square sauce pieces. 1. Cut out two 4"x4" pieces of white felt. 2. 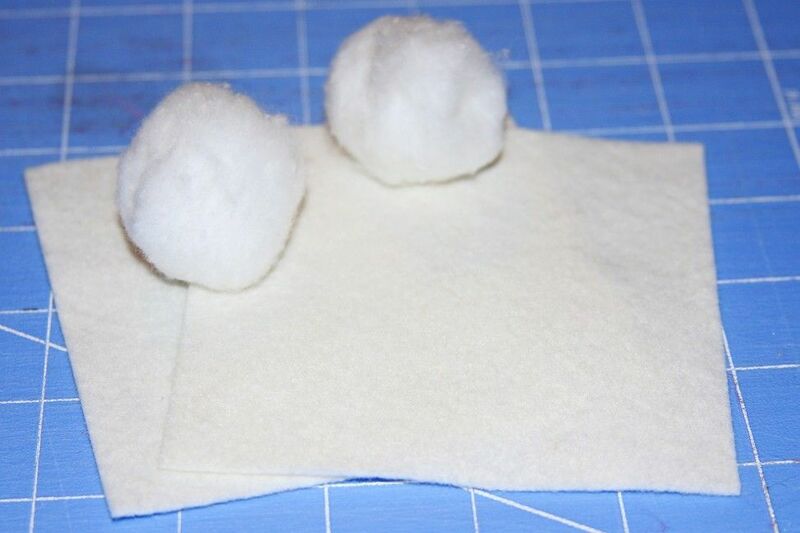 Carefully pull apart the two cotton balls and hot glue them to the top of one piece of felt. 3. 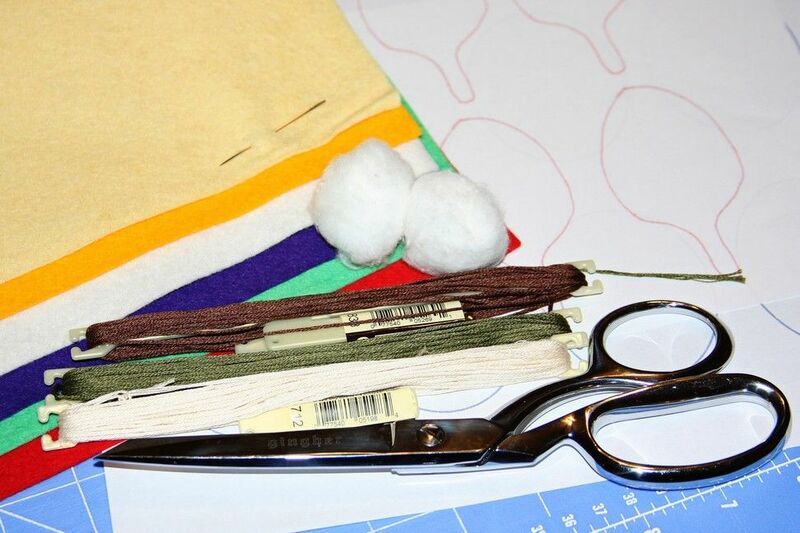 Trim any cotton that is hanging off the edges. 4. Hot glue the pieces of white felt together. You now have one square ricotta cheese piece. 1. Cut out (2) 4"x4" pieces of yellow felt and 3 1/4"w x 9"l strips of white felt. 2. 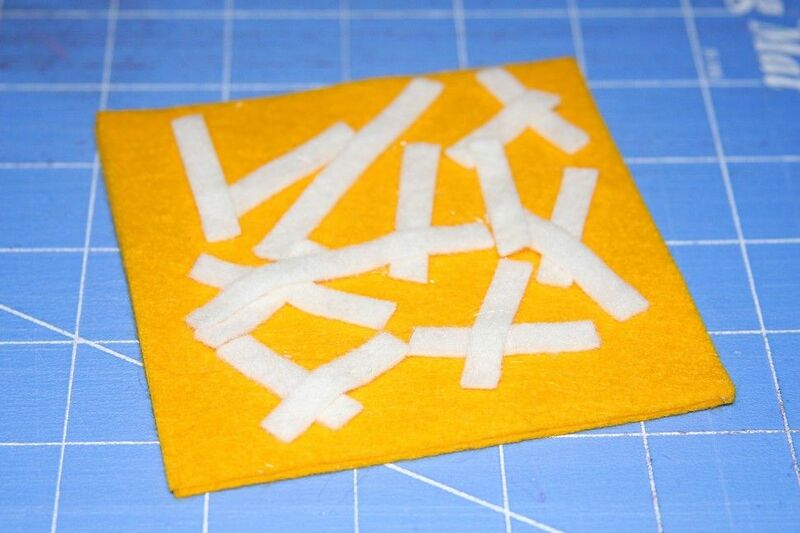 Hot glue the the yellow felt squares together. 3. Cut the white strips into random sized pieces. 4. 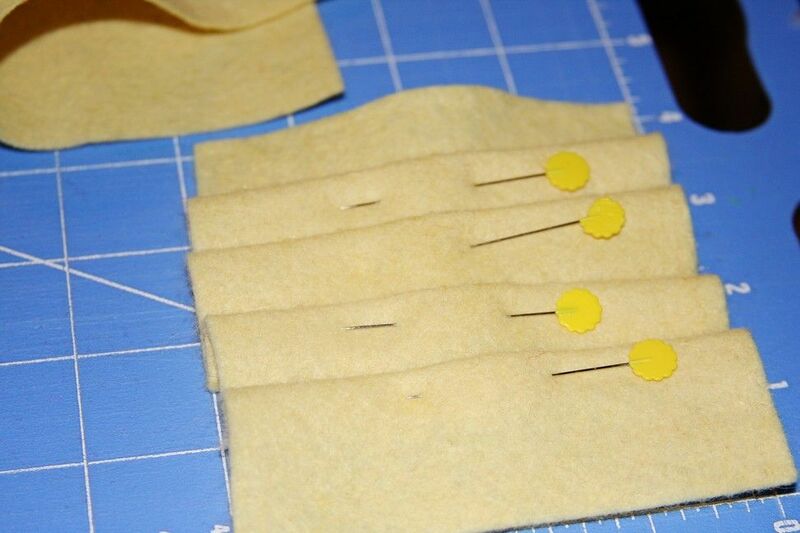 Hot glue the white strips haphazardly to the top of the yellow felt square. You now have one square cheese & shredded mozzarella piece. 1. Cut out a spinach outline from the template. Pin to the green felt. 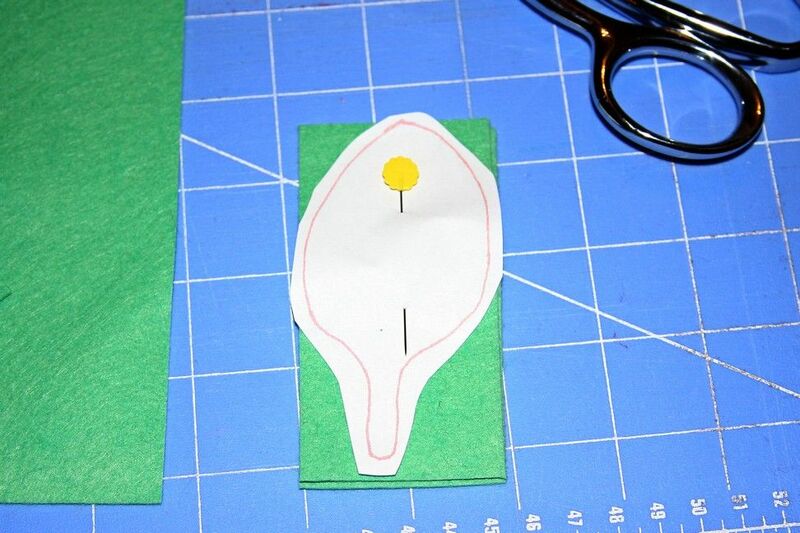 Make sure to fold the felt so you'll be cutting out two pieces out at a time. 2. 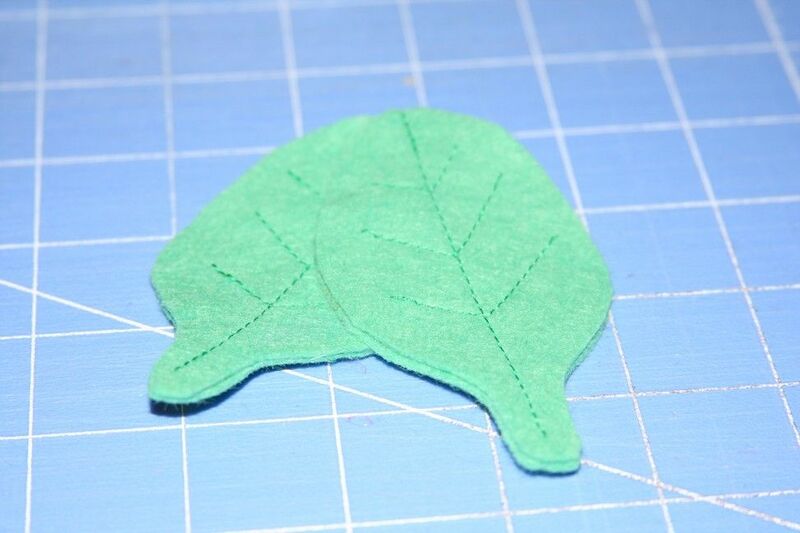 Sew "veins" onto both pieces of the felt spinach and trim the threads. 3. 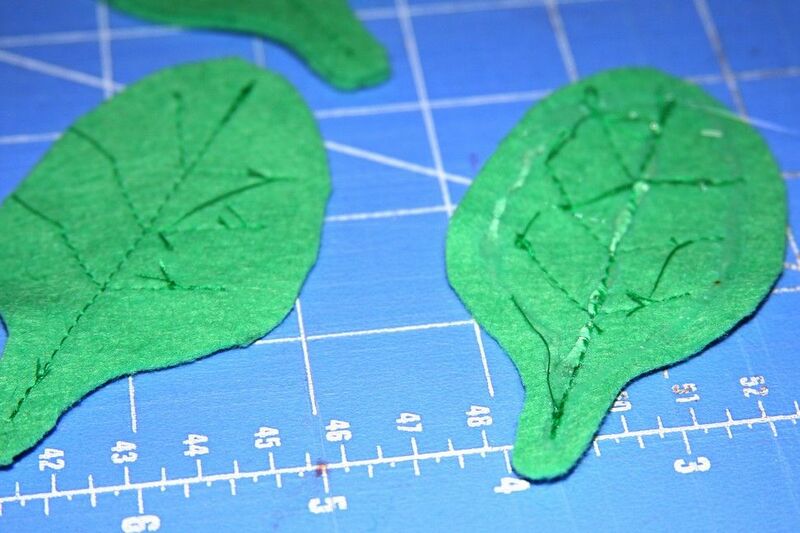 Hot glue the spinach leaf together. You now have two spinach leaves. 1. Cut out an eggplant oval from the eggplant template. 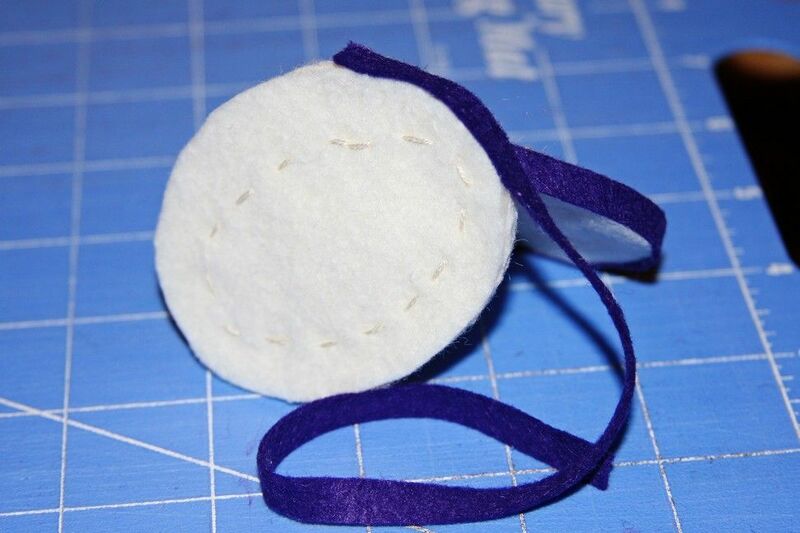 Pin to a piece of white felt. 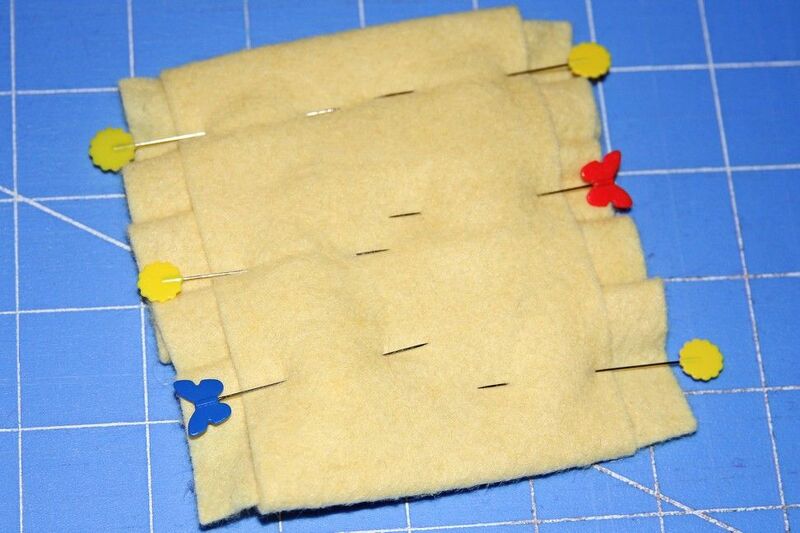 Make sure to fold the felt so you'll be cutting out three pieces out at a time. 2. 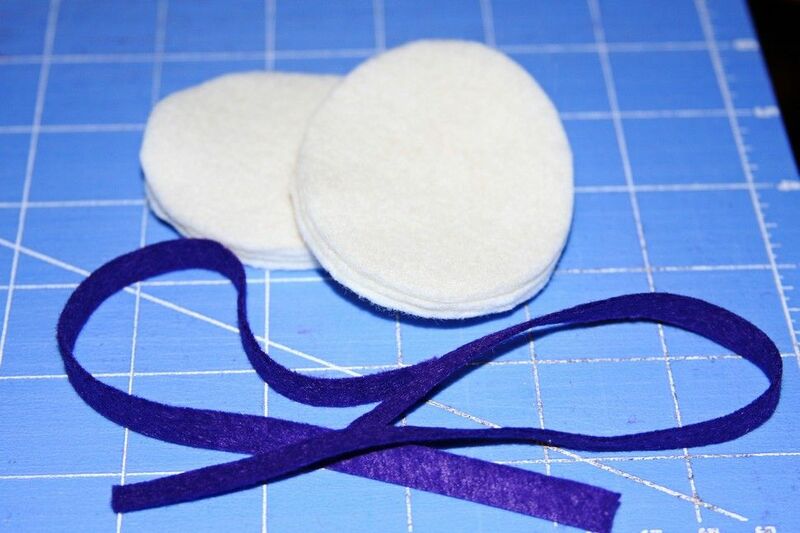 Cut a 1/4"w x 9"l strip of purple felt. 2. 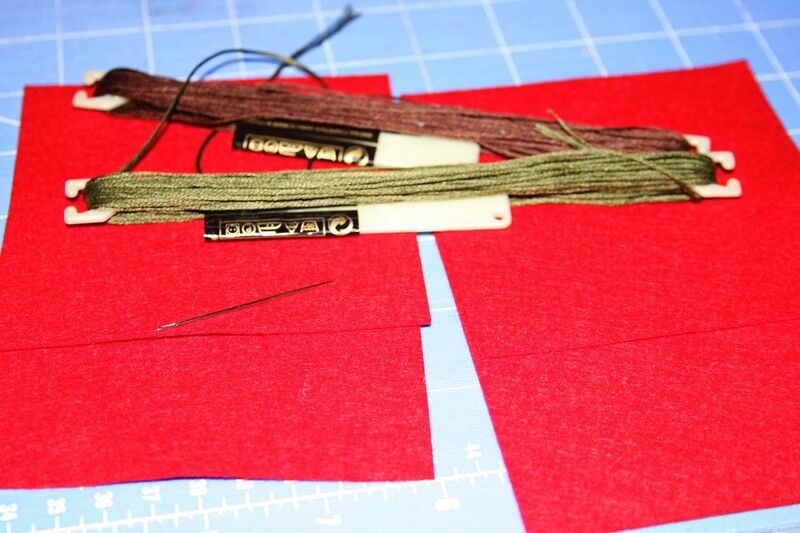 Embroidery a running stitch using the beige thread - follow the shape of the eggplant slice. 3. 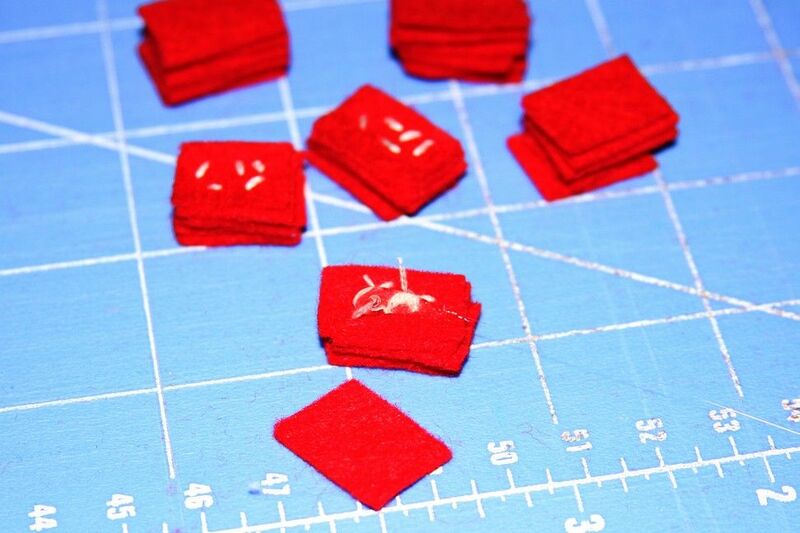 Hot glue all three pieces together - make sure your embroidered pieces are facing out. 4. Hot glue the purple felt strip around the edges of the eggplant slice. You now have two eggplant slices. 1. Cut out (3) 1/2"w x 9"l strips of red. Then cut the strips in half. 2. Pile the strips on top of each other and cut out (6) 1/2"-3/4" (roughly) pieces. 3. 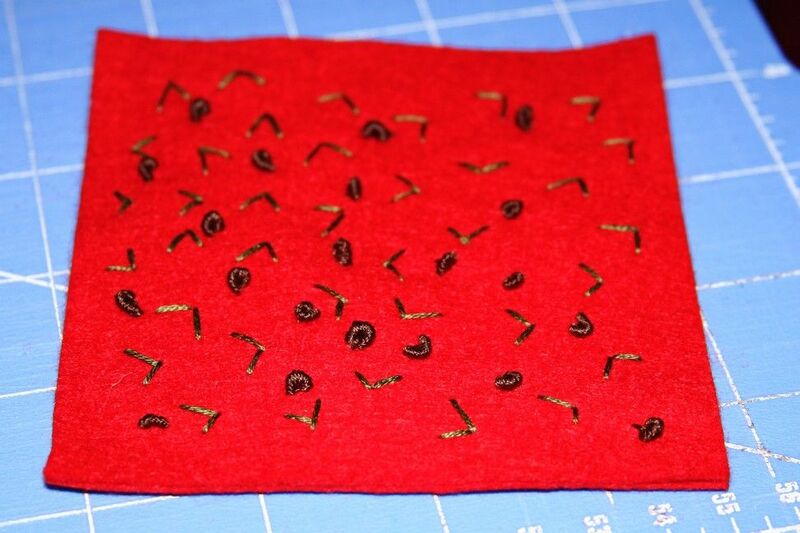 Sewing through 5 cut pieces at a time, make a few small embroidery stitches using the beige thread - these are the tomato seeds. 4. 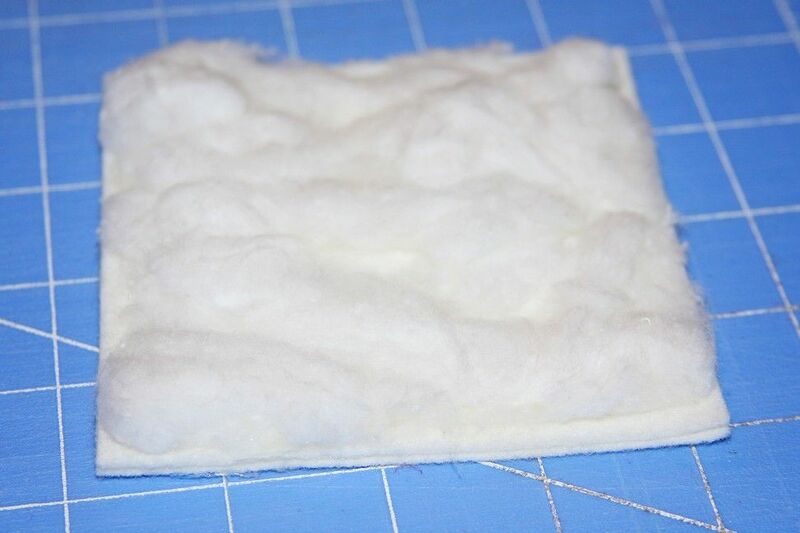 Place a bit of hot glue on the bottom of the 5-piece felt set, and then put the 6th piece on top. 5. Repeat steps 2-4 (5) times. You now have 6 chopped tomatoes. Pile the together to create a delicious Felt Eggplant Spinach and Tomato Lasagna! 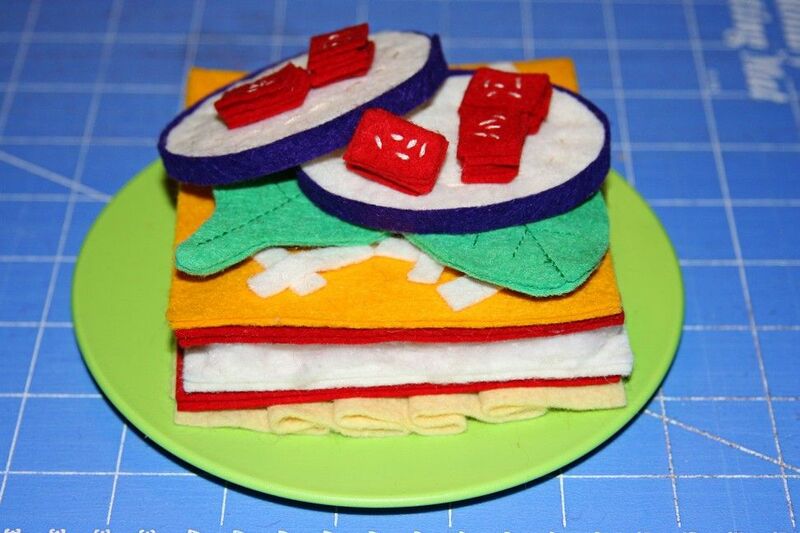 A HUGE thank you to Fawnda and Jeannine for the opportunity to share my newest felt food and introducing myself and my blog, Treasures for Tots to your readers!! Thank you so much for blog swapping with me! I LOVE your child's apron and felt cookies too! I want to make 'em for Serenity! Thanks for this cute idea. 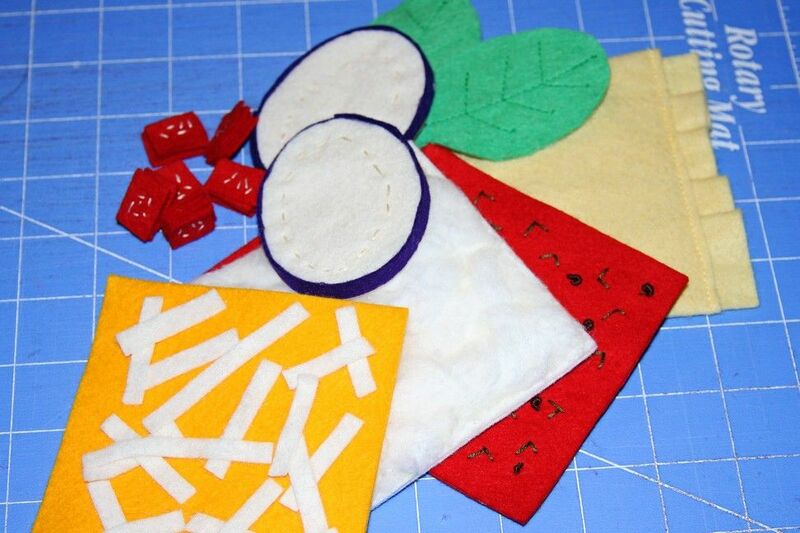 I love to machine sew & I love the look of felt play food, but hate all hand sewing that is required for most felt food. Good to see some other solutions!